WATG moved its Seattle Urban Architecture Studio into a 5,700-square-foot space in Olympic Tower at 217 Pine St.
WATG was the design architect, and Schuchart was the contractor. The team also included Commercial Office Interiors, furniture representative; and AllSteel-workstations/chairs. There are four employees in the office. Dennis Rehill, a WATG vice president, leads the Seattle studio, which focuses on commercial, residential and hospitality projects from urban infill to high rises. Erik Heironimus is a senior designer and leads design efforts on local and international work. 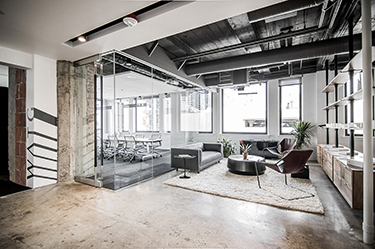 WATG also has urban architecture studios in London and Chicago. The team has done projects in the U.S., Europe, Asia and Africa. The Seattle space is designed to be simple but refined, so the focus is on projects and work process, the firm said. The design was achieved by stripping down the space to its original core elements: sand-blasted columns, exposed ceilings and lightly polished concrete slabs. WATG said it chose a pallet of materials that would parallel its design work. The open layout is framed by large windows with views of the waterfront and the city. WATG said the layout allows for collaboration between design teams, and large pin up areas adjacent to the work area allow “a constant dialogue” between digital and analogue design. Will Carroll and Matt Christian of Cushman & Wakefield Commerce represented WATG in the lease negotiations. Sally Patterson of CBRE represented the owner, Olympic Tower, LLC.